Ailis and her brother are orphans living in a boarding house in Chicago after the Great Fire of 1871. If you’ve read Sweep by Jonathan Auxier, you’ll remember how children were snatched by unscrupulous men to work as chimney sweeps. In this novel, children are also enslaved, this time by devious men who force them to work as rat-catchers in the sewers of Chicago. But twelve-year-old Ailis is fiesty and brave. She is determined to save herself and her brother from a grim future. 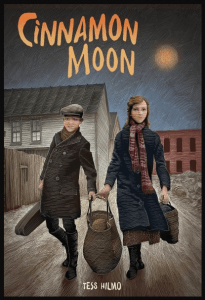 Cinnamon Moon is not a difficult novel to read as far the reading level is concerned. The narration is written in present tense and from the first person point of view, so the story feels up-to-date in its style. Furthermore, the font is a comfortable size and the lines of print are well-spaced. But the story itself is serious and based on historical facts which are explained at the back of the book. However, rather than being discouraging or depressing, this novel is filled with humour and hope. I think the history will interest you and the ending will inspire you. Hilmo, Tess. Cinnamon Moon. New York: Margaret Ferguson Books/Farrar, Straus Giroux, 2016. P.S. Always watch for books by Tess Hilmo: they’re invariably well-written.